The Transformers Siege wave 2 deluxes were first found at US retail earlier this month and since then a few reviews emerged. We have some below from both Chuckdawg1999 and Emgo. 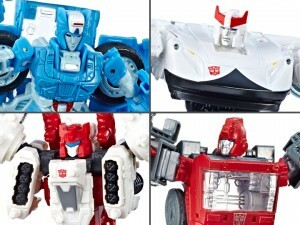 The reviews show us deluxe Chromia, Ironhide, Sixgun and Prowl. These are available at Walmart right now and are just shy of $20, which is the MSRP. Chromia, as you will see, is not a combiner limb and thus will not be part of the Elita 1 combiner. Let us know what you think of these toys and if you will be getting them all or not. chuckdawg1999 wrote: Ironhide is a large deluxe that feels solid but suffers from some thin plastic and weak panels with a weapon that could've been designed a touch better. SixGun has a weaker vehicle mode than Cog from Wave 1 but makes up for it with the sheer number of weapons it can form. Both are solid additions to any collection. chuckdawg1999 wrote: Prowl is a solid deluxe class figure and a nice update to the previously released Classics and Combiner Wars versions. Transformation is smooth and intuitive but the resulting figure has short legs that cause the overall proportions of the figure to look off. Being a core member of the Autobots it would be hard not to recommend their actual RoboCop. It's not a good thing, my friend. It's a GREAT thing! I'm super happy tonight too. I was tired after work and on the fence about stopping by another Walmart for a look at their Transformers section and just going straight home to decompress, but it paid off. I finally found both Starscream and Soundwave! I've got the Voyager Class of Wave 2 now covered, along with the Micro Masters in m stack at TFSource. The only Deluxe I've gotten so far is Prowl, though. Still need the other three and the Battle Masters. I was able to snag Six-gun on Hasbro Pulse for $9.99...but he still hasn’t shipped out yet. Nemesis Maximo wrote: I was able to snag Six-gun on Hasbro Pulse for $9.99...but he still hasn’t shipped out yet. So here's a funny question- what non-Siege figures do you guys think would "supplement" this line well? I can actually see a lot of the old BM Vehicon toys making very good cannon fodder (for either side with some stickers, depending on individual colours and designs), along with some of the Energon and Cybertron figures (Energon Landmine would look right at home next to the Siege Autobots IMO). On the 3P side of things, some of the Planet X figures might work quite well- the Seekers they made would IMO make very good generics ala the Bumblebee movie (helped by their Thundercracker and Skywarp having quite different colours from G1). Black Hat wrote: So here's a funny question- what non-Siege figures do you guys think would "supplement" this line well? I can actually see a lot of the old BM Vehicon toys making very good cannon fodder (for either side with some stickers, depending on individual colours and designs), along with some of the Energon and Cybertron figures (Energon Landmine would look right at home next to the Siege Autobots IMO). I picked up Starscream today. While he isn't as bad as has been made out, he defiantly breaks the streak of Decepticon voyagers being freaking awesome. Ironhidensh wrote: I picked up Starscream today. While he isn't as bad as has been made out, he defiantly breaks the streak of Decepticon voyagers being freaking awesome. I'm trying hard to hold out for a slight discount on Starscream. Bot mode looked good (better than expected in person), but I'm still not sold on the tetrajet with legs. 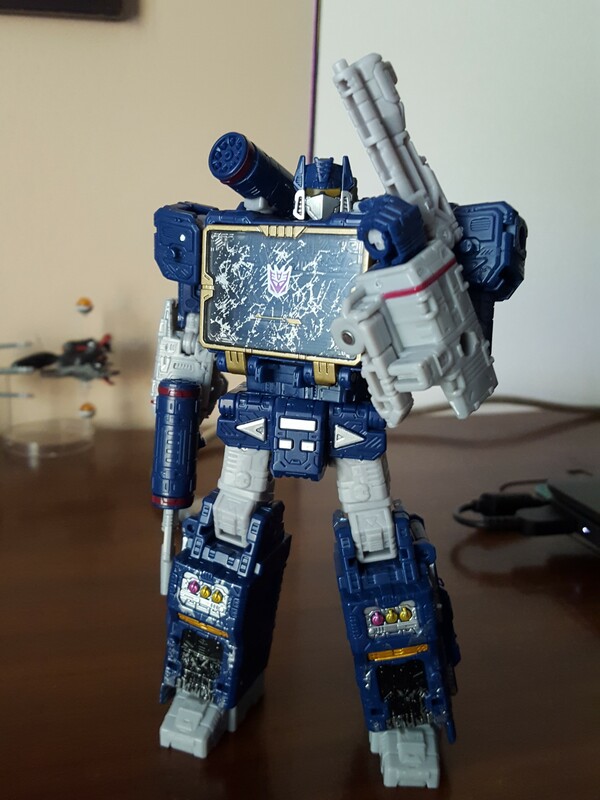 Soundwave on the other hand is murdering it. I even like his weird space barge thing. Soundwave is one of the better Generations figures made in a long time. So looking around online, I'm seeing the Deluxe size toys going for around $30 Canadian. Is that right? Can other Canadians confirm the price for me as I haven't been to any shops for a while due to no money. I can't remember if this has been shared but here's John Warden talking more about Omega Supreme. 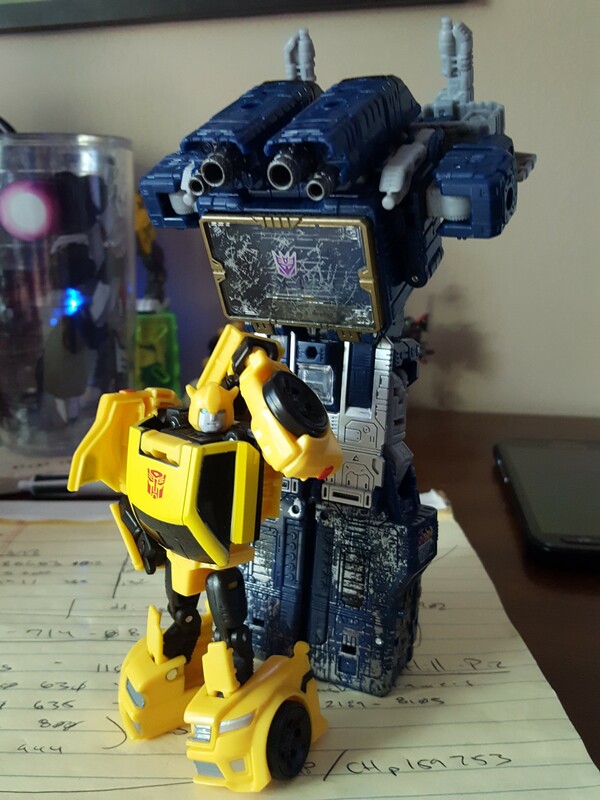 does anyone else have a soundwave who yeets cassetticons out of him? I wonder if the individual reflector figures can be used as guns for larger robots? 4,978 pages were recently viewed by 1,228 unique visitors. This page was viewed 1 times on Saturday, April 20th 2019 11:39pm CDT. © 2019 Seibertron, Inc. DBA Seibertron.com. All Rights Reserved. Established June 2000. Seibertron.com is owned by Ryan Yzquierdo.